CMI has developed a number of lightweight ballistic armor solutions using the MicroTruss technology. By introducing high performance materials into the open core architecture, the combined mechanical properties of the core and filler can exhibit exceptional performance which exceeds each individual component. 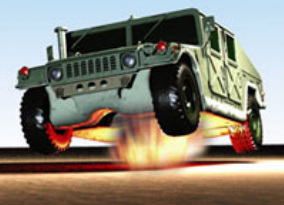 CMI has successfully developed solutions designed for large blast and impact attenuation on military vehicles, large infrastructure (bridges), and transportation payloads (railroad cars). Blast absorbing walls are custom designed to protect and secure critical areas. CMI has developed a number of thermal management systems which can simultaneously withstand structural and thermal loads. These include a passive jet blast deflector and a ship deck aircraft landing pad for the Navy.